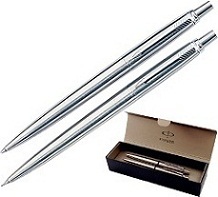 Impress high profile customers with our Logo Branded Customised Parker Pens to make a difference. The presentation box includes a branded mechanical pencil for drafting and editable notes, and a ballpen fitted with a blue ink insert containing quality documental ink suitable for most applications, paper or card. Engraved with your corporate brand name, exposure with a elegance gentry style. Customise your business gift the way you wish to tailor it to make that difference, whether to create customer loyalty or improve business opportunities. Fitted with blue ink insert, this quality documental won't leave customers in a pickle: it'll last long and be suitable for all writing applications. Presented in its display box, this stainless steel promotional presentation box will look striking on your customers desk.